80 years ago today the Spanish Civil War ended. We speak to leftist MP Alberto Garzón about why Spain struggles to remember its fight against fascism. In March 1939 General Francisco Franco’s fascist troops entered Madrid, after having subjected the Spanish capital to a brutal two-and-half-year-long siege. 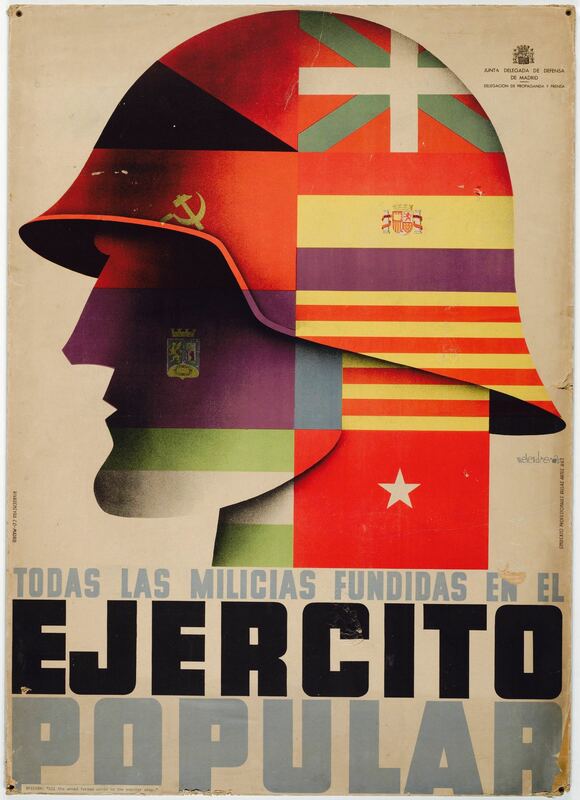 When the Spanish civil war ended on April 1st, at least half a million people lay dead – including approximately 150,000 as a direct result of Francoist terror. In the aftermath, 20,000 Republican prisoners were executed and thousands more died in Francoist concentration camps or in refugee camps in Southern France. Though a defining moment in Spanish history, commemorations of the 80th anniversary of the Civil War’s end will be muted within the country itself. The wounds of Franco’s dictatorship and the brutal post-war years remain raw in contemporary Spain. In the following extract, from an interview to be published in the forthcoming edition of Tribune, the Unidos Podemos MP and United Left leader Alberto Garzón argues that Spain’s inability to come to terms with Francoist crimes is bound up with the limits to the country’s transition to democracy in the 1970s. The eightieth anniversary is an important date, but it’s almost better understood outside of Spain than it is inside the country itself. We had Franco’s coup d’etat in 1936, a civil war that lasted 3 years and then afterwards there was a dictatorship that was firstly an accessory to international fascism and then later gradually modified towards its particular Francoist model. This regime was of the extreme right, but with its own peculiarities. When the Transition [to democracy, 1975-’81] came about, it was a transition directed and orchestrated by Francoist elites together with the opposition‘s own elites. It would not have emerged had it not been for working-class movements and civil society organisations coming out on the streets to confront repression, torture and suffering. They represented a force that was powerful enough to open a path towards a kind of democracy, but not one that was strong enough to overthrow the system. Therefore, what we had was a political transition that consisted of negotiation between two parties. This allowed the Francoist regime to preserve some of its previous privileges. Advances were made, such as public healthcare, public education and formalised democracy. Certain prerogatives, however, were maintained and allowed to persist: the influence of the Catholic Church, for instance, is enshrined in the constitution; the conception of Spain as a unitary entity protected by the army; and, most importantly, economic power was not touched and did not change in any meaningful way. The large corporations that were greatly enriched during the years of the dictatorship continued to dominate during Spain’s return to democracy and not much has changed since then. Many of them are among the most powerful in the country today. The children that came from successive generations of Francoist ministers continue to make up the Spanish social elite. Many of the judges in Spain today are the children of parents who were judges in the era of Franco. We have a country that has also inherited all the bad things from the Transition, as well as the good ones. And so, remembering the Transition also entails being conscious of the fact that a ‘pact of silence’ was made at the beginning of this period. It was said that, as those that carried out the Transition were in part responsible for the civil war, it would be better off not to speak about the war or the past ever again. You have to think that former President Adolfo Suárez, whose name now adorns Madrid’s international airport, had previously been the head of the Falange. This is like being head of the National Socialist party in Germany earlier in the century. Since facts like these made for uncomfortable truths at the time, a mythologised narrative was constructed around the Transition which fostered a kind of amnesia. This was done in part so nobody would remember that the heads and directors of Spain’s national newspapers were those who had been propaganda chiefs during the Franco years, so that people would forget big business’ ties with Francoism and so on. In this way, Spanish elites sought to erase the recent past, including the [1931-1939] Second Republic and all that went with it. This brings us to a paradox: the democratic values of the Second Republic and the struggles of the International Brigades are defended more widely and robustly outside of Spain than they are inside it. There are Second Republic combatants who went on to fight fascism in the French Resistance and who have had tributes paid to them in France and Germany. They haven’t any such commemoration in Spain. They died without even minimal recognition of their actions. This a historic anomaly – it doesn’t happen in Italy, it doesn’t happen in Germany, it doesn’t happen in France or the UK. But it does in Spain, because the Transition left this legacy. Forty years after the Transition, new generations of Spaniards, politicised by the Indignados movement, identify in the majority as Republicans. The state is performing a number of manoeuvres in order to avoid any kind of questioning of a monarchy that was chosen by Francoism – and then later ratified in the Constitution. The official polling and survey company in Spain, CIS, in fact stopped asking about the monarchy in 2014 in order to avoid there being proof of the Republican sentiment that exists in this country. On the eightieth anniversary I believe it should be appropriate for any democratic country to recognise those that fought against fascism. In Spain, unfortunately, this can’t happen because the country’s political Right sees itself as the inheritors of fascism; the left tradition of the Socialist Party views itself as the inheritor of the Transition, which of course isn’t the same. But, in the end, neither of the two take meaningful action to recognise this past. Subscribe here to read the full interview with Alberto Garzón, discussing Spain’s upcoming election and the prospects for its left, in the forthcoming issue of Tribune this April. This interview was conducted by Eoghan Gilmartin and Tommy Greene. Alberto Garzón is the leader of Spain's United Left and a Member of Parliament for Madrid representing Unidos Podemos, the left-wing alliance led by Podemos and the United Left.